Here’s a piece I wrote for Australia’s Lowy Institute for International Policy about the Regional Assistance Mission to the Solomon Islands. A pointed joke used to do the rounds in Honiara: if you needed to call on the Australian police you could usually find them in the Lime Lounge, a swanky cafe at the west end of the main street that serves silky flat whites and a range of delights including the ‘RAMSI breakfast’. The cappuccino cops were in town as part of the Regional Assistance Mission to the Solomon Islands (RAMSI), which aimed to support security, the economy and government following the period of political instability and conflict between 1999 and 2002 known as ‘the Tensions’. The Lowy Institute has for the first time calculated the cost of Australia’s contribution to RAMSI: a staggering $2.6 billion from 2003-13. The Lowy analysis implies that this sum amounts to one-third of gross domestic product, more than the Solomon Islands government spent over the decade. For a donor to spend more than the host government over such a long period may be without precedent in the Pacific region, if not the world. Such huge public spending also contradicts the advice of RAMSI government advisers, which was to lower expenditure. Given the amount of money invested, you’d think the economy would be purring like a finely-tuned Holden (maybe not a Ferrari, given that the economy was starting from such a low base). But after some initial success in restoring growth and calming the political situation, the economy stagnated, losing ground to its regional neighbours. Income per head is now among the lowest in the Pacific region. The following graph, using the World Bank’s official Pacific island small states category, shows income per head using the Atlas Method, which takes inflation into account and averages three years of exchange rate data so as to iron out short term fluctuations. Whichever measure you use, the rest of the region has pulled away from the Solomon Islands. The Solomons’ performance on the UN Human Development Index, which includes per capita income, education and health, lags the region and other developing nations. In 2003 the country was said to have ‘medium’ human development, ranking 123rd out of 175 countries. By the end of RAMSI, human development had deteriorated to ‘poor’, with the Solomons in 143rd place out of 186, just behind the Congo. You can’t read too much into this apparent slide owing to a change in how the rankings were calculated. But it remains the case that Solomon Islands’ human development performance is far from stellar. A quarter of people live in poverty, kids only go to school for an average of 4.5 years, and 36 out of every 1000 children won’t live to see their fifth birthday. Who knows what would have happened without RAMSI? Maybe the performance of economic and social indicators would have been even worse. But other island states in the region seem to have done all right. And economic development should have been imperative. The Tensions weren’t really just ethnic; they related to two decades of increasing poverty, worsening public services and the consequent failure of state legitimation. Many people looked at Honiara and saw a greedy cabal helping itself to logging wealth. As is customary the world over, a small minority, facing unsustainable deprivation and inequality, then looked for scapegoats. Beyond the RAMSI honeymoon period, Solomon Islanders (particularly the poor) weren’t really listened to. 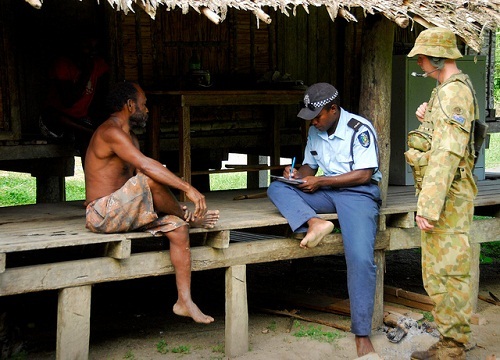 The RAMSI People’s Surveys only started in 2007, four years after the start of the mission. Education, health and wealth consistently featured as more important than would be suggested by the allocation of funding under RAMSI. Development interventions are usually only successful if they truly reflect local demands, not least because people don’t buy in to programs for which they haven’t asked. Australia burnt 83% of its RAMSI funding on law and order, a mighty $2.2 billion, spending only a tenth of that sum on the economy. So many dollars were spent on the cappuccino cops because Canberra was more scared about a failed state on its doorstep than about the future of ordinary Solomon Islanders. ‘The intervention…is in part about reducing the danger that vulnerable Pacific island states will become havens for transnational crime, including terrorism,’ said Australian Prime Minister John Howard in November 2003. What most people want is not just security but health, education and a better standard of living, which requires economic development. Economic growth would have created long-term stability and employment, and in turn the tax revenues for the state to provide for its citizens including hospitals, schools and, ultimately, security. Ploughing money directly into the police and law should always have been a short term measure; a stop gap until the country could fend for itself. Of the money spent on the economy, very little was on infrastructure or the vital ingredients of development. It’s telling that the pillar of RAMSI devoted to the economy was called ‘economic governance’, as if only oversight was needed rather than full scale intervention. Travel almost anywhere outside Honiara and you’ll be struck by the terrible state of the roads and bridges. Inter-island air and sea transport remains unreliable and irregular. Access to water and electricity is among the worst in the region. The tiny private sector simply can’t supply these vital needs, and donors must step in to provide them. If RAMSI had an economic strategy it appears to have been based on the misplaced hope that by studiously ignoring the economy and building, literally, Adam Smith’s famous ‘night watchman state’ the economy would flourish spontaneously. As we have seen, it didn’t. Economic development is about structural transformation; an alteration in the composition of the economy so that it moves from an agrarian, subsistence society into higher value-adding activities in services and manufacturing. Basic infrastructure enables those things to happen. Most successful developing-country governments performed a number of other key activities to grow productive capacity, including expanding investment, savings and the diversity of exports. The sad truth is that if you’d simply handed the $2.6 billion to Solomon Islanders they’d have done a better job of spending it. It’s the equivalent of 5900 Solomon dollars a year per adult over the decade, enough to meet one person’s entire basic needs. Despite the goodwill and dedication of many of the figures involved with RAMSI, the mission ultimately did not allow Solomon Islands to stand on its own two feet and to operate as a successful independent economy. The problem wasn’t that RAMSI was too expensive, it was that far too much was spent on law and order and not enough on building infrastructure and changing the composition of the economy, with the ultimate aim of improving the lot of the poor. The Lime Lounge continues to prosper and the police still start the day with a RAMSI breakfast, but many Solomon Islanders are ruing a missed opportunity. Image courtesy of the Australian Civil-Military Centre. A personal observation of changing attitudes to RAMSI in Honiara would be the mission’s contribution to SI’s very high rates of inflation. The influx of a large group of highly-paid “in-line placements” working within the Sols government led to sky-rocketing rentals and food prices in the capital. The market failure was such that this demand did not lead to increased supply – prices just went up. Worse, rising prices did not limit demand: RAMSI / AusAid simply responded to the increases by increasing allowances . As these rental prices pushed down from the top of the market, civil servants increasingly found themselves priced out of Honiara – breeding resentment to the the RAMSI placement sitting at the next desk.